Over the years, the Arab quarter of Singapore has become synonymous with Mediterranean and Middle Eastern food, shisha, rows and rows of fabric houses and fashion. Lanes are filled with people taking street photos of themselves in their outfit of the day (OOTD), makciks studying intricate lace patterns and people sitting at the many roadside stalls enjoying hot tea and coffee with crispy curry puffs. But the culinary scene within the Arab quarter is slowly changing, housing more than just skewers of meat, hummus and fresh bread. Slowly but surely, cuisines from all over the world like Vietnam, France and the USA are making its way to this area in Singapore. While such culinary introductions may not be anything new in Singapore, the introductions to this area however stand apart from its counterparts simply because it is halal. On a short lane that houses Hajjah Maimunah and Fluff Bakery sits Pho 4 All, a relatively new Vietnamese restaurant. Prior to discovering Pho 4 All, I would get my phở fix from The Orange Lantern but a walk down Jalan Pisang to photograph Fluff Bakery’s opening and speak with its owners led to my discovery of this new phở house. I had originally intended to visit Pho 4 All with Kit but when I glanced through their menu, I realised that it was not vegetarian-friendly at all so she had to sit this review out. Instead, I asked a good friend to join me for dinner there on a Saturday. I arrived at Pho 4 All slightly after 6.30pm in the evening and given its less-central location within the Arab quarter, it was rather quiet. We were offered two seats indoors but since the weather was kind to us that day, we decided to sit outdoors. Their indoor seating is rather small but cosy and would sit about 20 people quite comfortably. They have a couple of two-seaters and a number of four-seater tables that look like they can be moved around so if you’re dining in a bigger group, I am sure they will be able to accommodate you. I entered Pho 4 All with no expectations at all and I am happy to report that I left with nothing but praises for them. We were attended to by the owner of the restaurant who handed us our menus and left us to peruse before sending one of his staff to take our order after a while. The first thing that struck me while glancing through the menu was that it was a relatively small menu with only five mains and five sides. The next thing that struck me was that all their mains were phở which must mean that they probably knew their phở well enough to serve only this as the restaurant’s main dish. There were five varieties of phở on their menu – four beef phởs and a chicken phở. 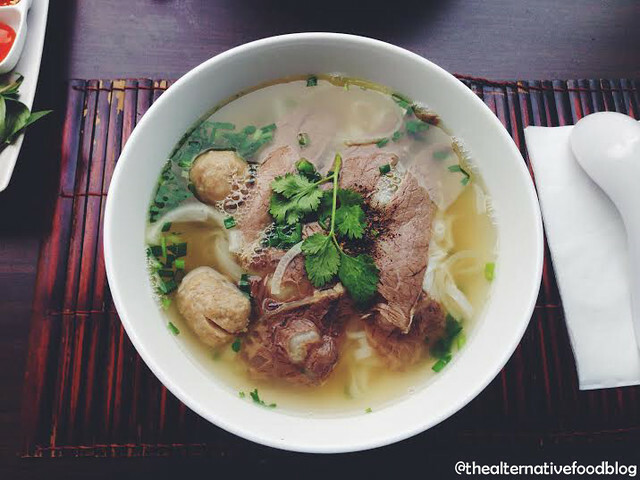 The four types of beef phở came with either a) half-cooked steak and well-done brisket (b) well-done brisket and flank, (c)well-done brisket, flank and meatballs or(d) half-cooked steak, well-done brisket, flank and meat balls. Not a fan of half-cooked meats, I ordered Option C, Pho Chin Bo Vien (SGD $9.50) and I was so amazed by the dish that was set in front of me when it arrived. My phở came served with a generous amount of clear soup, flat rice noodles, the brisket, flank and meat balls. I was genuinely impressed by their generosity with their ingredients, especially given that the dish was only SGD $9.50. Though I originally entered the shop with no expectations, I knew that I would end up comparing this dish to that which I had tasted at The Orange Lantern, for obvious reasons. What I liked about their version of phở was how unpretentious was. It looked honest and ‘home-styled’. It wasn’t overly-dressed with herbs or accompanying condiments so the entire dish was really about the taste of the phở itself. In fact, the only garnishing that was added was some parsley and the accompanying condiments were bean sprouts, some chilli and bay leaves. They also provided some chilli paste and black sauce ala yong tau fu style, perhaps for those who need stronger flavours. I didn’t add any of the condiments to my phở except for the bay leaves and the bean sprouts and I was thoroughly satisfied with my dish. I loved how flavourful the soup was on its own and I’m pretty sure that a lot of time went into preparing such a clear and flavourful broth. 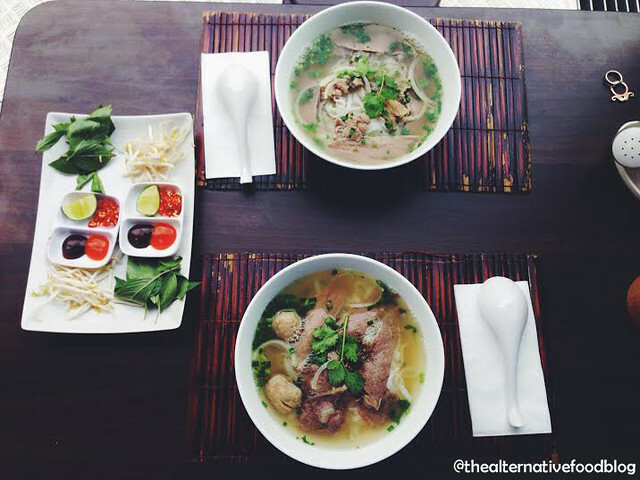 When I raved about the phở I had at The Orange Lantern, I shared that their beef slices were thick but flavourful. With the phở I had at Pho 4 All however, I was so taken by how thinly sliced the beef pieces were and how juicy the meat balls were. My meat, which was well-done, was tender, and it had no fat residue on it at all and to top it all off, it was well-seasoned. In my opinion, the combination of the soup, rice noodles and well-seasoned meat got four thumbs up from my friend and I. My friend ordered an almost similar dish [Option A: Phở bò tái nạm ($SGD 8.00)] but her dish came with half-cooked steak and well-cooked brisket. As per the menu, her dish came with half-cooked steak and the meat was just as tender as that which was served in mine. Though her steak was meant to be half-cooked, the heat of the soup eventually cooked it through a little bit more. As a testament to how much she enjoyed the dish, after a good thirty minutes of us talking while eating, my friend had an empty bowl with nary a drop of soup left. I’ll quote her on this, “I never finish my food so this says a lot”. To complement our meal, we also ordered Chả gio (SGD 7.00), a vietnamese spring roll dish with minced chicken and mixed vegetables, rolled up in rice paper rolls and deep fried. The staff who was tending to us also recommended we try their signature drink, their version of green tea. 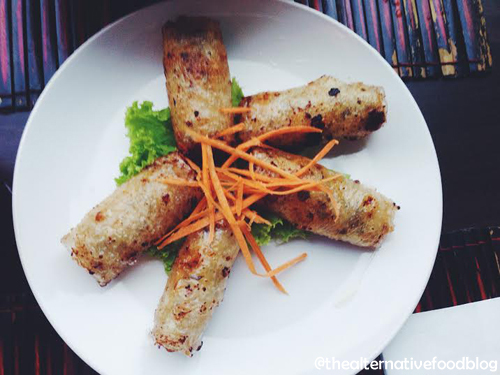 Most deep fried spring rolls that I’ve tried are often made with popiah skin which is made of eggs and flour. When those are deep fried, it is crunchy and crispy and after a few pieces, it can be quite heavy on the stomach. However, the chả gio is made with rice paper rolls so they are naturally lighter on the stomach. They have a slight crunch to them but they are more chewy than they are crunchy, which I actually appreciated. What I found interesting about the chả gio was the slight charring of the spring rolls even though it was deep fried. Perhaps it is how rice paper rolls react to being deep fried. Though the vegetables are lightly seasoned, the minced chicken was flavourful and the sweet dipping sauce that we were provided with paired well with the spring rolls. 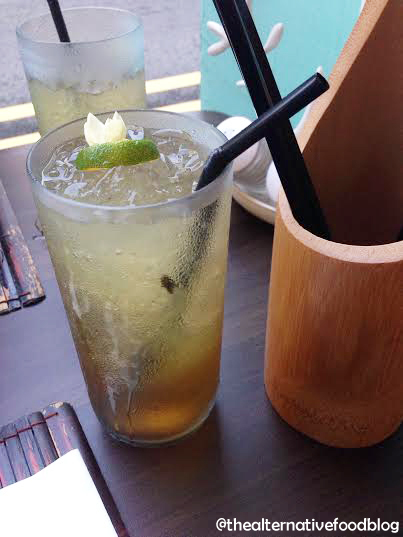 We washed down our meal with their signature Vietnamese Jasmine Tea (SGD 2.00) which came served in a tall glass and with a garnishing of a jasmine flower. When I ordered the jasmine tea, I was prepared to taste the usual jasmine green tea but I was pleasantly surprised to find that their jasmine tea had a nice lime hit to it. It was refreshing and very light. As an added bonus,the smell of jasmine wasn’t overpowering. I personally felt like the drink completed and complemented my entire meal. For SGD$2.00 a glass, I’d gladly order more. As we were paying for our meal, I spoke with the owner of the store and shared with him my compliments on my entire dining experience there. Grateful for the compliments, he shared that their food is prepared by a chef who hails from Vietnam as he wanted to guarantee the authenticity of the dishes that were presented to patrons. I did ask him about the small number of dishes on his menu and he shared that they were considering expanding the number of dishes they had to offer and he was kind enough to thank us for our feedback and compliments. Though initially I thought the small number of dishes might be a cause for concern, as I walked away from Pho 4 All, I found myself thinking about how this is probably a good example of quality versus quantity . Granted, Pho 4 All has a small menu but it is by no means a negative reflection of Pho 4 All. If anything, it has highlighted their niche, in pho, as their name suggests. Vegetarian Options: No vegetarian options.